We’re back for the second half of the list; the real top dogs. As I suggested in the previous half, the top four are all made of the same material; whilst it’s hard to compare between steel and wood, the general consensus is pretty firm that lumber provides the greater ride experience at the very top. At the turn of the millennium Holiday Park was a tiny German family park, its main attraction being a Vekoma corkscrew coaster built in 1979. For the park’s 25th anniversary and in a huge surprise move they announced that they would build one of Europe’s largest coasters, and it would be one of the most popular ride models at the time. For many years GeForce played off against Bizarro (then known as Superman - Ride of Steel), taking the top spot from 2002 to 2004, and they even tied for first in 2005. GeForce ranked Number 2 until 2010, but after this there was a surprising switch: whilst some had felt it was getting progressively worse, due to brakes being applied to certain airtime hills, these were suddenly removed. Just as Bizarro began to decline, GeForce was now pronounced the greatest steel coaster on Earth. It's the same model as Bizarro, a first generation Intamin hypercoaster, and has a similar layout: a multitude of airtime hills interspersed with a few overbanked curves and twisting hills. It is a little shorter in length and height, but is still a meaty 4003ft and 174ft respectively, and its signature manoeuvre is the stunning, twisting, near-vertical first drop, which many proclaim as being the finest on any ride. In the steel world the RMC conversions are certainly mounting a challenge, as are Intamin and Mack's newest launched creations, but for now this elder statesman of the steel game holds all the cards. 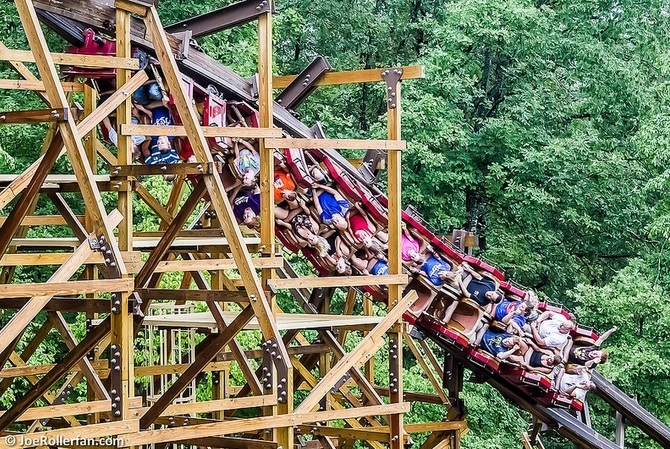 Built in 2013, Outlaw Run is the first of the RMC wooden coasters, of which Number 10 Goliath was the second. Building a prototype is always a gamble, especially when it's a ride of this magnitude, but the gamble paid dividends. The reason Goliath's announcement was met with doubt was because from the very offset its concept art looked weak compared to that of Outlaw Run. 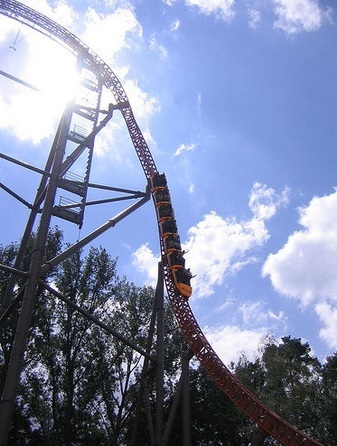 The earlier coaster had looked world class from the moment it was revealed: a huge first drop was followed by unique element after unique element: there's a "wave turn" (effectively an airtime hill which banks sideways at its apex), a number of true bunny hops, a ridiculous inverting turnover and a double barrel roll finale. The only real doubt people had during construction was whether it would ride smoothly, and the answer was resounding yes, far smoother than any standard wooden coaster in fact. The robust new track system that differentiates RMC’s woodies from the rest of the pack is what generates the glassy smooth ride, and is what allows the rides to have inversions. Next year two more of these monsters will open: Wildfire in Kolmarden in Sweden will become the tallest at 187ft, whilst Lightning Rod in Dollywood in Tennessee will become the fastest at 73mph thanks to a wooden coaster-first launch. Both look absolutely incredible, and I think we could see a reshuffle at the top in the near future. Amongst the communities that I'm a part of, Boulder Dash probably just edges into the top spot. Unlike El Toro however, it has never ranked Number 1 on Mitch Hawker, despite being the oldest ride on the list (having opened in 1999), and so I didn't feel I could quite justify putting it first. Custom Coasters International (CCI) were once by far and away the dominant force in the wooden coaster industry, building virtually all the highly regarded woodies in the 1990s and early 2000s. Boulder Dash was just one example of this and early on it was regarded as a fine but unexceptional coaster. CCI went bankrupt in 2002, and this unfortunate turn of events actually elevated the ride: when it required retracking (a very routine procedure on wooden coasters; the wood is degraded steadily with time) this was done by a newer company, Great Coasters International, and somehow the ride became one of the best around. It's not big, it's not particularly fast, but it provides an incredible terrain-hugging trip down the side of a mountain. A small drop through the trees starts the ride off, and from there the train picks up more and more speed, flying through an endless cascade of bunny hops and airtime hills before hitting the brakes. It's a simple concept, but the location and execution are flawless. South Korea you say!? Yep, that's right, the sane half of Korea is home to what I believe to be the best coaster on the planet. It's a prefab woodie from Intamin just like El Toro, but is about 25% longer than its American sister. If you're wondering about the peculiar name, I believe it's named after (ie. sponsored) by a major mobile network: think T Mobile - The Ride. Rumour has it that Everland went to Intamin and asked for a ride which literally took the first half of El Toro, and the entire layout of Balder (one of the other two Intamin prefabs) and jammed them together into one ultra-ride. The rumour has persisted for the simple reason that that's exactly what the ride does, although the first half is not as extensive as El Toro's incredible opening three hills. Bizarrely, despite how popular the prefabs all are, T Express is the most recent having opened back in 2008, which suggests we may never see another one of these incredible rides. The reason for this is unknown; they're not very expensive compared to steel coasters, and they've generally been reliable. It's a shame if it's the case, but with RMC, Mack and other Intamin models still in the ascension, we have nothing to worry about in the coming years.